Ever wanted to write, direct or act in a film? 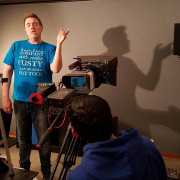 This group is for all aspiring film makers: from writers to actors, directors to crew; anyone who's ever wanted to be behind or in front of a camera! Everything from group meet-ups to discuss any projects members are doing or wanting to do, seeing film festivals and other social events will occur. Events will be posted on a regular basis and if you have any suggestions please feel free to suggest them.